This section will soon be filled with a HUGE photo gallery of several thousand MUD BOG pictures and videos! PUT US IN YOUR 'FAVORITES" SO you can find us easily! 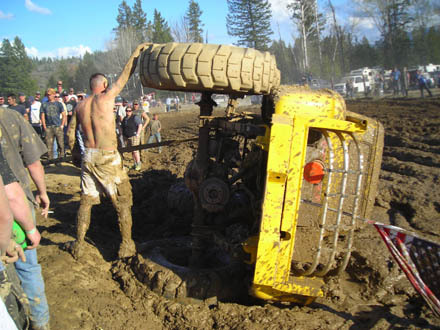 JEEPING in the Mud at Moyie Springs Mud Bog, Idaho. My favorite little weekend away from the office! 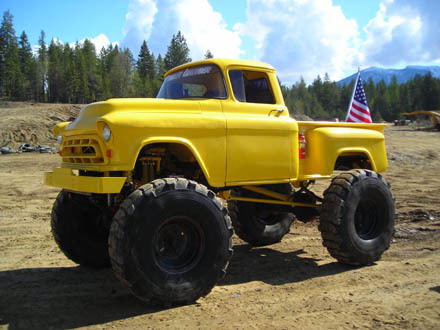 ....and in a CHEVY heartbeat, &%@# happens!!!! Join us in this PHOTO GALERY of pics from my family's favorite little weekend trip into the mountains! Twice a year we make the trek up by the Canadian border to enjoy a quiet weekend....OK, sometimes it's not so quiet!...with a few thousand of our favorite friends! 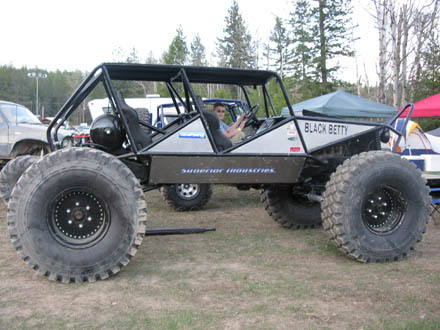 And sometimes, there are creations like this one, inspired by mechanical genius and the finest wine..."BLACK BETTY" is her name, and my son Marcus Howell, sitting here in the driver's seat, believes she is the sweetest mud bogging creation of them all! And yes, she is a tomboy...sweet and charming here...but wild and brutal in the mud and on the rocks! Our kind of redneck girl indeed! The ultimate mechanical hybrid! Eat your heart out, Toyota Prius! AND did I mention that the BOGS are popular with gals? So ladies, bring your bikinis and enjoy a day like you have never seen! Ahhh...the ultimate redneck sport....MUD WRESTLING! Even if you lose, there are certain fringe benefits! And there is just something about a beautiful gal when she is covered in mud! THE MUD BOG SITE IS UNDER CONSTRUCTION....soon there will be thousands of pics here! Stay tuned! And we will see you at the bogs! 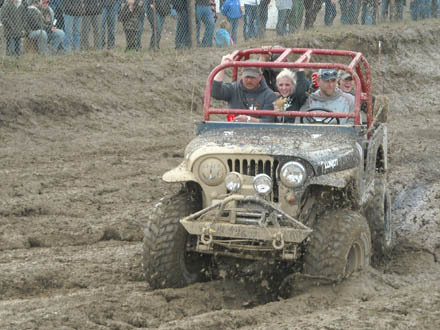 BESIDES Mud Boggers, we also photograph and video rock crawlers and dune buggies and anything else we come across. Being social by nature, Dad even stops random people in parking lots, and freeway rest stops, to make special arrangements to photograph their unique vehicles! So you may be surprised at some of our home built beauties that will be showcased here!